Another key difference is that this is the first season that companies can sponsor certain teams such as in soccer. The company logos will be located on the left chest of every team’s jersey. These logos will be on each of every team’s four different jerseys. Nike wanted to be unique by switching the names of the classic “home” and “away” jerseys to home being the “association jerseys” and away being the “icon jerseys.” Along with the association and icon jerseys, each team will have two separate alternate jerseys worn throughout the season. These jerseys come with some form of “home-court advantage” because the home team can actually choose which jersey they would like to wear, making the away team choose a contrasting uniform. This of course is only a marketing scheme. Although change can be a good thing, that is not the case for everyone. Some teams’ designs greatly improved while others plummeted. Let’s breakdown all thirty teams’ new uniforms for the 2018 season. The Hawks got away from their horrendous Adidas jerseys that debuted last season and upgraded to these incredible ones. They are showcasing an entirely new uniform with the black, green, and blue jersey; as well as bringing back the classic Hakeem Olajuwon throwback jerseys. The core home, away, and primary alternate jerseys have more of a clean look despite maintaining the basic design they had last year. There is not much different about the Celtics new jerseys this season other than the GE logo. However, they remain having some of the best uniforms in the NBA so if it isn’t broken, don’t fix it. I could not find any images of the Nets new jerseys but the link attached is the YouTube video the team sent out. Literally nothing changed other than the addition of an ad. They are the same old black and white jerseys. Nothing special just like their roster. These jerseys are fire. Perfect color scheme, design, font, everything. They are definitely in contention for the best in the NBA. The Hornets are the only team that signed with both Nike and Jordan. I think its obvious why they signed with Jordan considering their owner is none other than MJ himself. Just like the Nets and Celtics, very little has changed. Same great and iconic jerseys. Moving on. Despite the Cavs having a terrible offseason and they seem to be heading in the wrong direction, they did come out with the best uniforms their franchise has ever seen. Cleveland has historically had bad jerseys, but they seem to have struck gold with these. Big time upgrade from the Cavs. Tough to call these uniforms “new” as we have seen these exact ones for years. I guess Cuban shut down the idea of change right away. Yawn. These jerseys are like when you give your friend your homework to copy but say “change some stuff so they don’t look exactly the same.” This is essentially what the Nuggets did with the Pacers. As the Pacers changed their uniforms, the Nuggets seem to have copied theirs but made a few minor edits. They even changed their color blue from powder blue to navy to make them look EVEN MORE like Indiana’s old ones. The should just go back to the throwback rainbow jerseys because those are all time greats in any sport. Yet another team that basically keeps the same uniforms and makes minor changes that have zero impact. Only change I can see is the ad. Warriors make no changes. other than the neck line. It’s disgusting, like why did this ever happen? Maybe these designs are good luck considering they run the NBA? Maybe? Either way these are garbage. Same old, same old. It’s like some teams don’t even want to have anything change. Next. One hundred times better than their old ones. From the logo, to the trim, to the tiger stripes up the sides, these jerseys are awesome. They provide a new look for a new look Pacers team. These might be the best part of Indiana’s season however, because the players actually wearing these jerseys (minus Myles Turner) are lucky to have a job in the NBA. Similar to the Cavs, the Clippers have historically had bad uniforms for the history of their franchise. They have had more uniform changes than playoff wins it seems. However, I think they finally chose the correct jerseys. Simple with bold colors. Perfect, now lets focus on winning some playoff games over at Lob City. It is borderline illegal for the Lakers to change their uniforms. The classic purple and yellow scheme is a statement NBA jersey, as well as an all time classic. I was thrilled when I saw that they kept the jerseys the same other than some very minor edits. Grizzlies went with a cleaner look with their uniforms this year. A few minor edits to the font and the stripes up the sides really tied their look together. Very underrated jerseys mostly because of their amazing color scheme. No breath-taking changes here, but there are small yet necessary ones. Miami is yet another team that makes no changes to their uniforms, but nobody is mad about it because there is nothing to change. All in all, there really is not much anyone could ask to switch with these. The Bucks have such good uniforms. They transitioned to a much more professional look after ditching the Christmas looking red and green ones with the buck as the logo. Love their new design. However, they may have picked the worst sponsor ever design wise. The Harley Davidson patch does not blend well AT ALL with the green and white color scheme. It is so frustrating that the first thing I notice is that hideous patch that completely contradicts what would otherwise be fantastic uniforms. They should push hard for another sponsor to contend with best uniforms in the league. I am sure they have other issues on their plate such as making a serious playoff run but hey lets just ditch that patch. When I saw these, my jaw quite literally dropped…but not in a good way. I have always said that the TWolves had some of the best uniforms in professional sports. Then they went ahead and showcased a completely new look. Maybe this new look symbolizes the beginning of a new era with the monstrous offseason that occurred in Minnesota, but even then I am still upset at this change. I do respect however, that they fully took advantage of this Nike deal and went all in on remaking their jerseys while other teams made little to no edits. Fitbit will sponsor the TWolves this season and their logo does go well with their new design. Ultimately, I think that they downgraded big time on their uniforms. There doesn’t seem to be much different about the Pelicans new uniforms this season. Maybe they brought in the side trim a little bit or made some edits to the font. Ehh, who knows. Nothing too exciting here. Mediocre jerseys. The Knicks, like the Grizzlies, seem to have made minor edits to their uniforms to give them a more professional look. The font barely changed but makes a big difference. Everyone knows that the Knicks are a mess and as sad as it is, these uniforms might be the best offseason move they had. Another team without any major changes. Decent uniforms. They are still a relatively new franchise I guess but only having three uniforms in their franchise history is not nearly enough. If I were them I would have grabbed this Nike opportunity by the horns and done an entire rebrand. But whatever, what do I know about NBA front office. Simple answer, the same as the Knicks…nothing at all. Same jerseys for the Magic. I’m fine with it, and don’t see anything wrong with them. You can’t help but smile when you see that Disney sponsors them. Of course “The most magical place in the world” sponsors the Magic. It’s like puzzle pieces coming together. If they want to upgrade their uniforms, then wear the black ones with the blue lettering and white pinstripes that Shaq and Penny wore. Here’s the link to the jersey release for the 76er’s. The one grudge I have against these are that the font makes it seem like you need to put on 3D glasses to read them. They almost pop off the shirt. Anyways, Philly is sponsored by StubHub this year which, similar to the Bucks, is a sponsor logo that doesn’t go too well with the jersey. The Suns had the best jersey upgrade of this Nike transition. 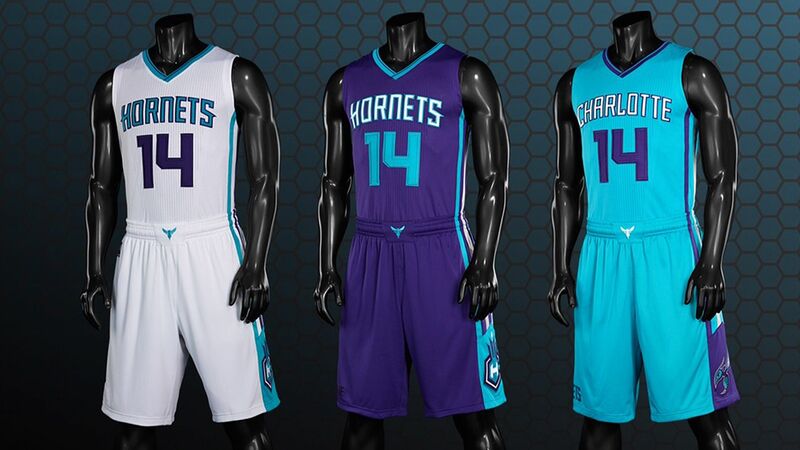 There is nothing to dislike about these from the design, to the color scheme, to the Suns logo on the shorts. These are clean and bold. Great new uniforms for a young and exciting team in Phoenix. The only real difference I can see from these jerseys to last years is the font. The new Nike uniforms seem to be more simple and bigger. I also like the addition of the logo on the shorts. They definitely made the right decision by putting “ripcity” rather than their logo. It is tough to mess up the black and red color scheme as Portland shows here. The Kings have always had awesome jerseys simply because of their color scheme. Purple + Black + Silver + White = Perfection. Similar to the Suns, the Kings have a young and exciting team that will make these jerseys sell fast. Big upgrade for the Kings. Did anyone think that the Spurs were going to make any changes? Of course not. However, they did add a new version of their logo to their shorts which looks good. Other than that, same old jerseys for the Spurs to nobody’s surprise. The Raptors recently changed their uniforms so I did not really expect them to do any change with Nike. They have identical jerseys with their home and away uniforms from last year, but they did make some edits to their red alternates. Like the Magic, the Raptors should bring back the T-Mac and Vince Cater purple jerseys with the red raptor logo. Those are on the Mount Rushmore of best jerseys of all time. The Jazz kept the same design concept with their Nike uniforms. Which totally makes sense because the J is a music note, as they are the Jazz. Why they once had mountains as their logo when their name was still the Jazz will forever confuse me. Anyways, same jerseys mostly for Utah. The Wizards kept the same theme for their uniforms. However, their white jerseys ditched the stars and stripes trim up the sides and replaced it with a blue trim and red stripe. Same jerseys for Washington. Ultimately, most teams uniforms stayed the same despite Nike coming into the picture. Not many teams (other than the TWolves) really took a hit with their jerseys. There is news that every team will have one or two alternates this year, but those designs have yet to be released other than a few teams here and there. Next Post Next post: Ever Wanted to Play in the Las Vegas SuperContest? Well Here is Your Chance!